Get daily national news in English with The Tutors Academy. 1. According to the report, after verification and reconciliation, the total value of the ₹500 and ₹1,000 notes as on November 8, 2016, when demonetisation was announced, was ₹15.41 lakh crore. The total value of such notes returned from circulation is ₹15.31 lakh crore. RBI data showed that the value of banknotes in circulation increased by 37.7% over the year to ₹18.04 lakh crore at end-March 2018. 2. The Union Cabinet on Wednesday approved the release of an additional 2% of DA for Central government employees. “The Cabinet approved the release of an additional instalment of DA to Central Government employees and DR to pensioners with effect from July 1, 2018,” a release said. Prepare for NDA, CDS, and AirForce with The Tutors Academy. And get daily updates & national news in English. 3. The State government in matrilineal Meghalaya has made it mandatory for married people to produce marriage certificates for all official purposes.The government also decided to deny government jobs and benefits to men who have abandoned their families. 4. The Arunachal Pradesh Assembly on Wednesday passed a Bill for the creation of three new districts — Pakke-Kesang, Lepa Rada and Shi Yomi – in the State. Deputy Chief Minister Chowna Mein had introduced the Arunachal Pradesh Re-Organisation of Districts (Amendment) Bill, 2018, in the House on Tuesday. The Assembly passed the Bill by voice vote. 5. India is set to get more disaster warning systems along its coasts. While it already has a tsunami warning system in place, the new systems will keep an eye out for “tsunamis and storm surges,” according to an official release. The system is part of a programme called O-SMART (Ocean Services, Technology, Observations, Resources Modelling and Science) that is being piloted by the Union earth sciences ministry. It was cleared by the Cabinet Committee on Economic Affairs on Wednesday, at an outlay of ₹1,623 crore. Other key missions under O-SMART include, according to the press release, strengthening of Ocean Observations and Modelling, strengthening of Ocean Services for fishermen, setting up marine observatories for monitoring marine pollution, setting up Ocean Thermal Energy Conversion Plant (OTEC) in Kavaratti, acquiring two coastal research vessels, continuation of ocean survey and exploration of minerals and living resources, technology development for Deep Ocean Mining and manned submersibles and the setting up six desalination plants in Lakshadweep. 6. 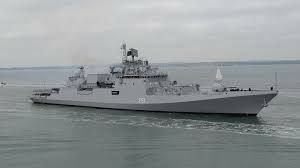 An Indian Navy warship of the Western Naval Command patrolling the Gulf of Aden rushed to the help of a Norwegian vessel after its all-Indian crew sent a distress call on August 25. MV Vela — owned by Seven Sea SA, Norway, and Fleet Management Ltd., Hong Kong — was in deep trouble as its port anchor and 330-metre-long cable, weighing approximately 42 tonnes, had slipped into the Gulf of Aden. 7. Exercise Peace Mission 2018, the joint military exercise of the Shanghai Cooperation Organisation (SCO), ended in Russia on Wednesday with the eight-member states undertaking joint training on combating terrorism. This is the first time India and Pakistan participated in the exercise, which began on August 24 at the firing ranges in Chebarkul. India, China, Kazakhstan and Russia showcased their armoured and mechanised forces while Pakistan had sent only Special Forces personnel. The Indian delegation was led by Lt. Gen Satish Dua, Chief of Integrated Defence Staff. 9. The India-U.S. “2+2” dialogue will see External Affairs Minister Sushma Swaraj and Defence Minister Nirmala Sitharaman meet U.S. Secretary of State Mike Pompeo and Defence Secretary James Mattis on September 6 in Delhi. The purpose is to get four key policymakers on the same page. This stems from the idea that India-U.S. ties are increasingly strategic, and in recent years, there have been concerns that while military ties and exercises have increased rapidly, diplomatic convergences aren’t keeping pace. Conversely, despite close diplomatic exchanges, key defence agreements have not yet been completed. The talks will also review the U.S.’s South Asia policy on Afghanistan and its Indo-Pacific strategy. This refers to a phenomenon wherein human beings in combat situations face various forms of fatigue after the end of combat. This happens due to the shifting back of the body’s limited energy from control of the sympathetic nervous system to the parasympathetic nervous system. In combat situations, the body usually responds by deploying the sympathetic nervous system to draw energy to perform functions that are necessary for basic survival. This causes functions previously performed by the parasympathetic nervous system to be neglected. When the neglected demands are finally satisfied, however, the body faces a backlash of fatigue. 11. The Cabinet on Wednesday approved an increase of 79.3% in the project outlay for setting up the India Post Payments Bank to ₹1,435 crore. The move comes three days ahead of the nationwide roll-out of the payment bank by Prime Minister Narendra Modi. The additional sum of ₹635 crore in the revised cost estimates is on account of ₹400 crore for technology costs and ₹235 crore for human resource expenses, an official release said. 12. State-owned Indian Oil Corporation Limited (IOCL), India’s largest fuel retailer is planning to almost double its retail outlets to more than 52,000 in the next three years, from 27,000 now to maintain its market leadership in fuel retail. These include both company-owned and franchisee-run outlets. Together, state-owned oil marketing companies (OMCs) — IOCL, Hindustan Petroleum Corporation Limited (HPCL) and Bharat Petroleum Corporation Limited (BPCL) have plans to to add 50,000 new retail outlets in the next three years. 13. Beginning September 1, motor third party (MTP) insurance for new cars and two-wheelers will be issued for a longer duration as opposed to one year now. From next month, motor third party insurance for new cars will have to be purchased for a period of three years. For new two-wheelers, the cover will mandatorily be for five years. A. Sharath Kamal & Manika Batra, bronze, mixed doubles. 16. The Union Sports Ministry and the Sports Authority of India on Wednesday hailed the achievements of hockey legend Dhyan Chand with a function at the National Stadium named after him. August 29, Dhyan Chand’s birthday, is celebrated as the National Sports Day. Meaning 1 – (with reference to moisture or a smell) discharge or be discharged slowly and steadily. Meaning 2 – (of a person) display (an emotion or quality) strongly and openly. Meaning 2.1 – (of a place) have a strong atmosphere of. Get daily “National News in English” and latest updated current affairs to crack all competitive exams.